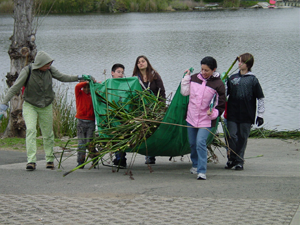 Volunteers remove tules at Lake Chabot before the Youth Fishing Derby. The Vallejo Watershed Alliance welcomes volunteers of all ages. Families, groups, seniors, individuals and couples — we’d love to see you! If you are interested in volunteering, simply come to one of our events listed on the home page. If you wish to bring a group, please let us know in advance by emailing us at info@VallejoWatershedAlliance.org or calling (707) 652-7812. If you are under 18, you must have a waiver signed by a parent or legal guardian. Dress for a gardening-type activity: comfortable protective clothing, sturdy shoes, hat, sunscreen, and gloves are all excellent choices. We provide water, refreshments and tools. The Alliance planning committee meets once a month and invites input from the public. Meetings are generally the third Thursday of each month. They are held at 7:30 a.m. to 9:00 a.m. in the Boardroom at Vallejo Flood & Wastewater District, 450 Ryder Street. Hello, When are your upcoming clean up dates? I see one on April 22nd. Are there any in May? Please let me know and thank you. Yes! The creek cleanup will take place on Saturday, May 13. We will meet at the corner of Fairgrounds Drive and Coach Lane at 9:00 a.m. I will post this event on the website as soon as the two April events have passed, but you can mark your calendar! Yes, absolutely! We could use you at the Blue Rock Springs Creek cleanup: April 21, 9-11:30 a.m. Park at the Wardlaw Dog Park and follow the path behind the park, crossing the bridge over the creek. Wear comfortable clothes and sturdy shoes, hat, sunscreen, and gloves. Your site captain is Don Broderson.